Heat milk in a small saucepan over low-medium heat. Add butter and slowly melt. Then, gradually add the sugar and dry yeast and stir to combine. Be careful not to overheat the milk. Place flour and some salt into a large bowl. Add the egg. Slowly pour in the milk mixture. Using a standing mixer or a hand mixer, knead until an elastic dough forms. Transfer dough to a lightly floured surface and continue to knead by hand. Place dough into large bowl and cover with a clean kitchen towel. Allow to rise in a warm place for approx. 1 – 2 hours until doubled in volume. Transfer dough to a lightly floured cutting board. Knead and form a log. Carefully flatten the log with your hands. With a sharp knife, separate the dough into three strings. Make sure to leave the upper part intact. 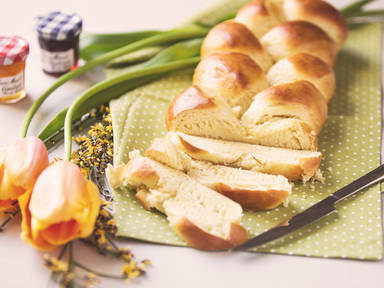 Beginning from the top, carefully braid dough into a loaf. Tightly seal loose ends. Transfer braid to a lined baking sheet. Cover and allow to rise in a warm place for approx. 45 – 60 min. Preheat oven to 200°C. In a small bowl, combine egg, 2 pinches of sugar and 1 pinch of salt. Whisk until creamy. Brush dough with the egg mixture. Transfer to oven and bake for approx. 30 – 35 min. until golden. Remove from oven and allow to cool. Enjoy for breakfast or with your afternoon tea.